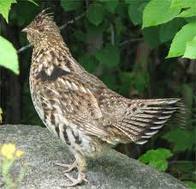 Bird Hunting or Grouse Hunts for Ruffed Grouse, Partridge, Sharptail Grouse and Spruce Grouse are popular and favorable sport here in Northwestern Ontario as it is a fall experience. Hunting Grouse in the Rainy River district is not only a successful and exhilerating Bird Hunt, but the fall colors of the leaves and trees and vegetation is spectacular. Nothing like a walk through the woods enjoying a sunny afternoon that the Grouse like as much as we do. You can often see Grouse sunning themselves on a log or on the side of the road, so watch while you're driving as they're often right on the road too! The diversity of the hunting trails and bird hunting areas makes Grouse Hunting in Ontario a great experience at our hunting lodge! 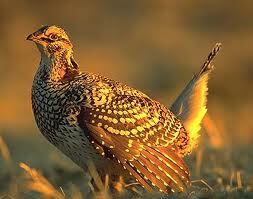 Whether Sharptail known as Prairie Chicken, Ruffed Grouse known as Partridge or Spruce Grouse these upland game birds are plentiful here in hunting season. Although we do not offer a separate Grouse Hunting Package at this time, Grouse Hunting is often enjoyed with DUCK HUNTING, BEAR HUNTING or a fall FISHING expedition. We know where to find them and will gladly give you some grouse hunting tips, show you where to go on a map, or take you there. You may also enjoy some fishing and GOLFING as part of your hunting holiday.